A member of the 1964 United States Olympic Gymnastics Team, Ron Barak captured National Collegiate Athletics Association (NCAA) championships in the All-Around, Horizontal Bars, and Parallel Bars events in preparation for that year’s Olympic Games. In 1961, Barak won the Combined Events (12 exercises) title at the World Maccabiah Games in Israel, as well as capturing gold medals in the Horizontal Bar, Parallel Bars, and Flying Rings individual events. In 1962, he was a key member of the University of Southern California Trojans’ NCAA Championship gymnastics team. 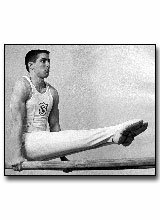 From 1965 to 1968, Ron was head coach of the USC varisty gymnastics team. In 1967, he coached the United States gymnastics team to a silver medal in the World University Games. In 1964, Ron received USC's Jacob Gimble Award as "scholar/athlete of the year".